Over a period of some years, I have gained several gigabytes of email. Customers, suppliers, friends have all emailed me. Some have made it into my address book. Some even made it onto a good marketing list. But most have sat, in my email, and now I am against just deleting them. I have searched the web for a program to help gain something out of all this email. What I want to do is extract all the contact information out of my email boxed, spend a little time tidying it up, and then utilise it as a mailing list. These are people that know me, or at least have emailed me, and I feel I want to use their addresses and just send out some marketing information. A newsletter, a public information release, details of a new product. Even just an update for some contacts or are not even aware we've moved office 2 years ago, or expanded, or are still here even working away. 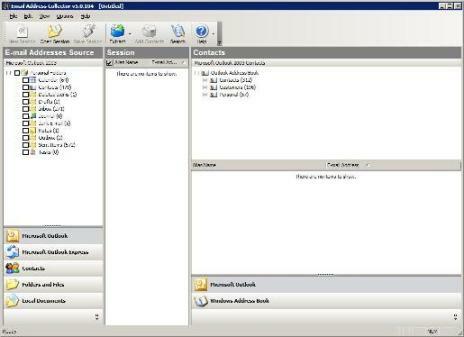 The best program I found for extracting the email addresses was "Email Address Collector". I selected the folders within outlook I wanted extracted and all the emails, firstnames and surnames are put into a simple to export list. Below is a screenshot of the main extraction windows. The extracted list is placed in the middle for easy tidying before you export.